I think that's a generic code, when googled the general consensus is it is your mass air flow sensor. Diagnostic scanner for home use. Roewe wrote: Any cheap ones on ebay for around $50 would do the trick, that's what I use for tuning on mine. Thanks actually bought one for £12 on eBay, seems to talk to the car ok. Will wait for anything to pop up and hopefully it will be able to tell me what it is. Would prefer no warnings though lol. 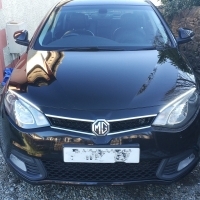 Does anyone know of a diagnostic scanner for home use, that can be used on the MG 6 diesel? My local garage could not diagnose a engine fault that came up after a service and belt change. They let the battery get quite low and luckily after driving it has gone off and not come back on. The nearest MG dealership is a ferry journey and 40 mile drive so if I could self diagnose any problems it would be helpful. Ignore was thinking oil filter. Thanks for that Donald, this is what I have just now, but my question is is there a ready made complete unit that can be used instead of the shell with the paper eco filter? Like the one I quoted above? Thanks redzpete for that, I'm sorted for this service. Will buy in advance for the next one. It is listed for Mg6 diesel has anybody used it?